The vegetarian pepper balls are wonderful finger food and a great starter too . 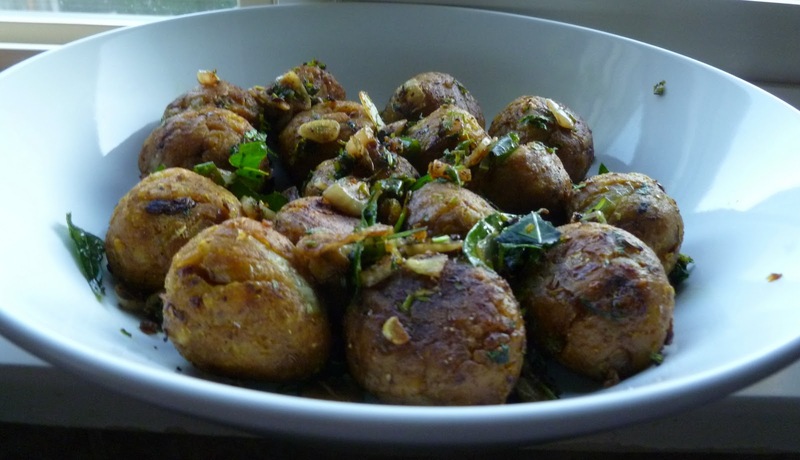 These balls can also be added to any gravy to make a nice kofta curry . Wash the banana well and cut into half and remove the top and bottom . Boil and cook the banana till fork tender. Remove the peel , cool and grate the banana. The peels can be used to make banana-peel-stirfry . Heat oil and add s. jeera and cook for 30 seconds. Then add onion and ginger garlic paste and stir well. When onion turns translucent add chili , turmeric and coriander powder. Stir and add the grated banana, amchur and salt and mix well. Cool and mash with your hands and form small balls. Pour a tbsp oil on a baking tray and roll the balls . Arrange the ball on the tray and bake till golden at 350 F.
Heat oil and add the onion , garlic and chili . Cook till the garlic turns light golden on the corners. Add curry leaves, amchur and pepper powder and mix. Add the green onion , coriander leaves and soya sauce. Add the balls and mix everything well for few minutes. Add you are ready to serve. PS: Original recipe has used a cup of grated carrot and a cup of grated lauki too. I once made raw banana koftas in tomato onion gravy... It was a big experiment for me as I was in school... This reminds me of that. Would love to try this. It looks so yummmy! Super tempting and highly inviting veggie balls..
Vegge balls made out of Raw banana ..wow its so inventing....very good idea....this looks perfect.....Have a Happy New year.. Very flavorful, never tried with raw banana! Happy new year!! this sounds interesting...looks so yummy n inviting...thanks for the recipe..